Japanese Religions on the Internet draws attention to how religion is being presented, represented and discussed on the Japanese Internet. Its intention is to contribute to wider discussions about religion and the Internet by providing an important example – based on one of the Internet’s most prominent languages – of how new media technologies are being used and are impacting on religion in the East-Asian context, while also developing further our understandings of religion in a technologically advanced country. Scholars studying the relationship of religion and the Internet can no longer work on prevailing notions that have thus far characterised the field, such as the assumption that the Internet is a Western-centric phenomenon and that studies of English-language sites relating to religion can provide a viable model for wider analyses of the topic. Despite this growing amount of research on religion and the Internet, comparatively little has focused on non-Western cultures. The general field of study relating to religion and the Internet has paid scant attention to Asian contexts. The field needs a full-length and comprehensive study that focuses on the Japanese religious world and the Internet, not merely to redress the imbalances of the field thus far, but also because such studies will be central to the emerging field of the study of religion and the Internet in future. They will provide important means of developing new theories, constructing new paradigms and understanding the underlying dynamics of this new media form. Erica Baffelli is a Lecturer in Asian Religion at the University of Otago (New Zealand). Both her doctoral research (Ca’ Foscari University of Venice, 2005) and her post-doctoral research project as fellow of the Japan Society for the Promotion of Science (JSPS) investigated the relationship between the media and ‘image construction’ of Japanese new religious movements. Her research interests lie primarily in the groups’ self-presentation online and offline and in the interaction between religion and popular cultures. Ian Reader, now Professor of Japanese Studies at Manchester and formerly Professor of Religious Studies at Lancaster University, has spent over a quarter of a century researching on religion in Japan. Author of several books (including Religion in Contemporary Japan 1991, Practically Religious 1998, Religious Violence in Contemporary Japan: The Case of Aum Shinrikyo 2000 and Making Pilgrimages: Meaning and Practice in Shikoku 2005), he has most recently worked on issues of public representation and marketing of religion both in off- and online contexts. 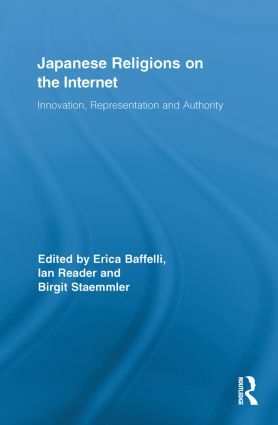 Birgit Staemmler has been a member of Tübingen University Japanese Department’s research focus on Internet and religion since 2000 and is currently working on definitions and contexts of the term ‘Shamanism’ in the Japanese Internet. Her doctoral research focused on a ritual of mediated spirit possession in Japanese new religions and was published as Chinkon Kishin: Mediated Spirit Possession in Japanese New Religions (2009).